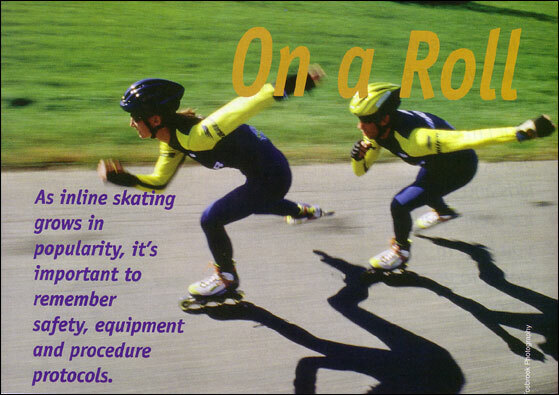 As inline skating grows in popularity, it's important to remember safety, equipment and procedure protocols. Inline skating is one of the fastest-growing recreational activities in the world. Routine inline skating produces nearly the same increase in aerobic fitness that running does. Inline skating creates high muscular activity levels for hips, thighs and shins. It also works the leg muscles for longer periods of time than running and produces less than half the impact shock to joints that running does. With the growing popularity of the sport, there are many choices of skates, bearings, brakes and spacers to consider. Let's begin with hardware. You want a skate that feels comfortable. It should fit snugly, but not so tightly that the blood flow to your leg is cut off. You should be able to wiggle your toes inside the skate. Also, there should not be areas where there is extra pressure. Make sure the skates you try on are not rubbing against your ankles, as this will create blisters. Try tightening the laces and/or buckles if this occurs. Inline skates come with laces and/or buckles that snap on. Laces provide a better fit and distribute pressure on the foot more evenly. However, some people prefer buckles because they are easier to fasten quickly and can tighten or loosen in specific areas (e.g., the ankle, foot or toe areas). The choice of laces or buckles usually depends on personal preference. Because of the extra padding inside the skate boot, sizing usually increases one-half or one regular shoe size. For example, if a person wears a size 10, then they would probably wear a 10 1/2 or 11 in skates. In my opinion, the best recreational skate available is the Salomon line and K2 softboot line. The Rollerblade line with the softboot comes in a close second. Other companies, such as Bauer, Oxygen and Ultra Wheels, all provide good quality skates, but they are not as performance-minded as the Salomon and K2 line. For years, inline skates were made with hard plastic shells. K2 invented the softboot, which revolutionized the recreational inline skating market. The softboot skates feel more like a hiking boot than a roller skate. The softboot line runs around $150 to $300, depending on the year it was made and the store where it is sold. The Salomon runs higher in price (around $200 to $350), but the quality makes it well worth it. Salomon invested millions in research before creating their product. The result is a top-of-the-line skate. The laces tighten and hold automatically like a ski boot, and the ABEC-5 wheels in the TR and FT models spin longer than in any other skates I have used. The Salomon and K2 both have shock absorbers within the frame of their skate. The accessories of an inline skate are about as significant as the skate itself. Wheels, for example, are very important. They vary in size and durometer (the hardness rating of the wheel material, polyurethane). The harder the wheel, the longer it will last. Hard wheels also produce a slightly smoother ride. Size and durometer ratings are usually labeled on the side of the wheel. Durometer is an industry hardness rating for polyurethane, which is the primary wheel material. Ratings such as 76A, 78A or 85A are usually seen on wheels. The higher the rating, the harder the wheel. Aggressive skaters usually want smaller and harder wheels, but the recreational wheels run a little bigger and usually lower in durometer. The most well-known brand of wheels is Kryptonics. The most common wheels for skates are 76 mm/82A. When replacing the wheels, choose the same size and durometer if you are satisfied with your last wheels' ride and durability. Choose a slightly larger wheel if you want to go faster or want them to last longer. Also, make sure the new wheels you buy fit your skates. ABEC-5 through ABEC-11 or Swiss bearings. Bearings can also be bought separately, usually where inline skates are sold. The most well-known company that makes bearings is Kryptonics. However, I would personally recommend the BOSS Swiss Bearings as the fastest bearings available. Spacers connect the bearings inside the wheel. Most skates come with plastic spacers, but some prefer aluminum spacers for greater durability. Inline skate brakes are usually company-specific. In other words, the brake will only fit the skate it was made for. Rollerblade developed the ABT-brake, which is activated by moving the skate forward instead of having to raise the front part of the skate. The part of the skate covering the back ankle is its own component and pushes the brake down automatically. Finally, always use protective gear. Protective gear includes a helmet, knee pads, elbow pads and wrist guards. The helmet is the most important element. Most wrist guards are designed so if a fall occurs, the skater can slide on the hard plastic shell with hands extended forward. Obviously, the knee pads prevent injury or scrapes to the knees, and the elbow pads prevent injury or scrapes to the elbows. Make sure to get wrist guards, elbow pads and knee pads that fit correctly. You don't want them to be too tight, but snug enough to remain in place when you are skating. Remember, safety should be always a priority. The best way to get up from the ground on skates is to first bring up one knee while the other knee is on the ground. Then, put both hands on the knee that is up, pushing until you are standing. To familiarize yourself with the skates, start out in dry grass. After you are in standing position, get used to standing and crouching with your hands while wearing the skates. Once you are comfortable standing on pavement in your skates, try pushing yourself forward slowly with one skate while the other points in the direction you want to go. Push yourself with the back skate facing diagonally. Push off so the wheels don't spin, but produce friction between the wheels and the road to create speed. If you try to push off with the back skate facing forward like your front one, you won't go anywhere because your wheels will just rotate. Alternate between the two skates, creating a stride. As you gain more experience, the tendency will be to crouch lower and push off with greater force in each stride. On inline skates, the brake is in the back of the skate instead of the front, such as on roller-skates. The best way to brake is to use the "scissor" motion. While you are coasting with both skates parallel, move one skate forward and the other skate backward for balance. Tilt the forward skate backward, bringing the front of the skate up and pressing down on the heel. The harder you press, the faster you will stop. Practice braking before you try any steep slopes or hills. In order to turn, some beginners find the "tray method" works best. 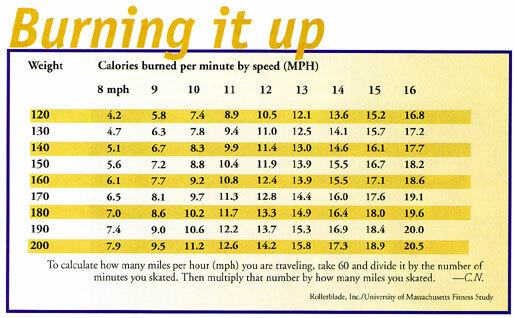 While coasting, pretend you are carrying a cafeteria tray with your arms. Move your arms to one side and your skates will usually follow your body. Others find it easier to turn by concentrating on where the emphasis of the foot is placed on the skate. Avoid skating in dirt, sand or water. This will shorten the life of your bearings. To clean your bearings and get them rolling more efficiently, many skate shops sell a spray-on lubricant/cleaning solution. To clean your bearings thoroughly, take the bearings apart and soak them in a citrus degreaser. Rotate the wheels of your inline skates to increase their durability. Depending on how much you skate, the wheels may become worn, especially on the inside. Rotate first and third wheels with each other and the second and fourth wheels with each other. The idea is to move the most-worn wheel to where the least-worn wheel is so they all last longer.